Eddie Mercer promised he wouldn’t lead many laps in the Blizzard Series Miller Lite 100 Super Late Model race. Mercer, the defending Blizzard Series champion, pulled away from the rest of the field. The last of four cautions came on a restart on Lap 65. Stanley Smith tapped Ryan Crane going into Turn 1 as Smith tried to take second place. Both drivers spun in front of a pack of cars, forcing Dave Mader III and Wes Loyd into the pits. Jay Middleton led the first 35 laps as he led a pack of Smith, Mader, Long and Crane who pulled away. The other contenders settled for staying back, saving tires. Long took the lead on Lap 36 from Middleton as they worked through lapped traffic. As Long tried to lap Roger Reuse, he got into the back of him, spinning Reuse out, bringing out the second caution of the race and bunching up the field. At this point, Jeremy Pate was in sixth place after starting 21st. He was the fastest qualifier in time trials, but his time was disqualified during inspection. He worked his way up to fourth before developing an oil leak. He made several pit stops under caution, fixing the problem before working his way up to sixth. Mercer (#72) passes early leader Jay Middleton (#74) for the lead. But it was that strategy that allowed him to win the opening race Friday night at Five Flags Speedway. Race rules dictated no pit stops for fresh tires unless a driver had a flat. So Mercer was content to fall back at the beginning, going from second to 10th, but then he began to work his way back. 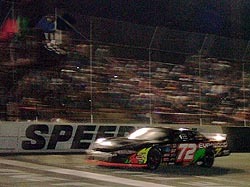 Mercer led the final 30 laps, passing Donald Long for the lead. Long finished second, followed by Scott Carlson, Ronnie Sanders, Josh Hamner and Jeremy Pate.